Like Jimmy Stewart in Rear Window, NYPD beat cop Alex Tanguy will try to crack a case while he is laid-up with a broken leg. However, Tanguy will have help from a legitimate superhero. Yet, his secret weapon is also a scared little boy facing his own potential mortality. 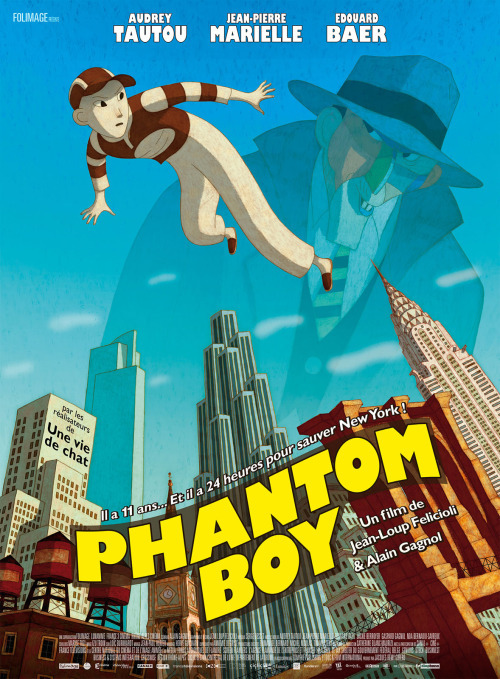 Alain Gagnol & Jean-Loup Felicioli riff on the film noir and superhero genres while keeping the human element front-and-center in the flat-out fantastic Phantom Boy (trailer here), which screens during the 2016 New York International Children’s Film Festival. Ever since young Leo was diagnosed with cancer, he discovered he could astral project. While resting from chemotherapy, he often leaves his body to help guide other patients’ wandering spirits back to their corporal selves. Most forget the experience when they awaken, but not Tanguy. The hard-charging cop was ambushed by henchmen of a megalomaniacal villain who has taken New York hostage with a well-placed computer virus. Due to his bad rep, Tanguy’s captain refuses to listen to his intel, but crime reporter and potential love interest Mary Delauney is more than willing to follow-up his leads. Leo’s invisible projection will watch over her, feeding back warnings of potential danger to Tanguy through his sleep-talking body. Of course, there are limits to how long Leo can remain in his spectral form. Much like in their Oscar-nominated A Cat in Paris, Gagnol & Felicioli’s super-stylish 2D animation lovingly evokes film noir, art deco, and comic art. They develop a number of sly gags, including the frequent interruptions of the super-villain referred to as “The Man with the Broken Face” as he attempts to tell his origin story. Yet, it is the relationships that make Phantom Boy so poignant and endearing, particularly Leo’s quiet moments with his beloved little sister, Titi. It is also quite moving to watch through Leo’s spectral eyes as his worried parents attempt to put up a brave front for his benefit. Frankly, this film packs an emotional wallop, but it also takes care of its noir crime-fighting business with considerable panache. In fact, Gagnol’s closing line is absolute genre perfection. Phantom is just a quality production from top to bottom, featuring expressive voice work from the likes of Audrey Tautou as the Rosalind Russell-ish Delauney and Jean-Pierre Marielle as the sinister mastermind. For extra, added seasoning, Phantom also uses various jazz recordings of “Dream a Little Dream of Me” as a recurring motif (you’d think they’d use “I Cover the Waterfront” considering how much action takes place on the docks, but so be it). Altogether, it looks and sounds great and leaves viewers feeling like their batteries have been recharged. 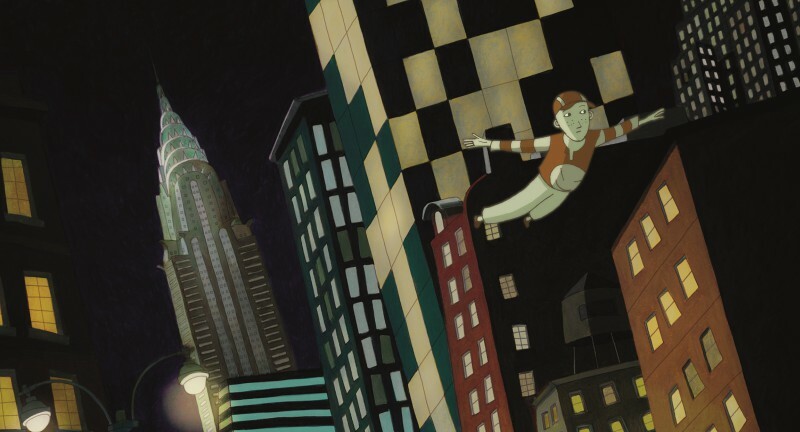 GKIDS has had quite a few Oscar nominations in the past, but Phantom Boy just might be able to sneak away with the prize next year. It really deserves it. Very highly recommended, Phantom Boy screens this Sunday (3/6) and Saturday (3/19) at the SVA Theatre, as part of this year’s NYICFF.